Sadly accepting that I wasn’t allowed to cook in her 1958 galley (there was a marvelous double wooden sink that looked like it wanted some action) I decided to save the meal for Night Town. 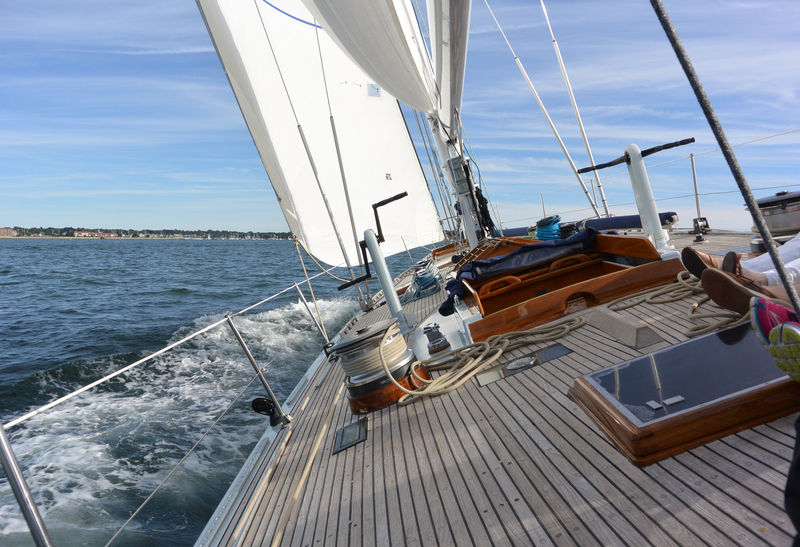 Besides, the lobster recipe I had in mind would have made this sleek, swift America’s Cup winner belch, bloat and bulge at her seams. There’s no such thing as “light and refreshing” Lobster Mac ‘n Cheese. The recent popularity of Lobster Mac ’n Cheese is no surprise. I’m sure it was created for all of us who still think Macaroni and Cheese is the most delicious, gratifying meal on earth, but we’re too old to order off the children’s menu. 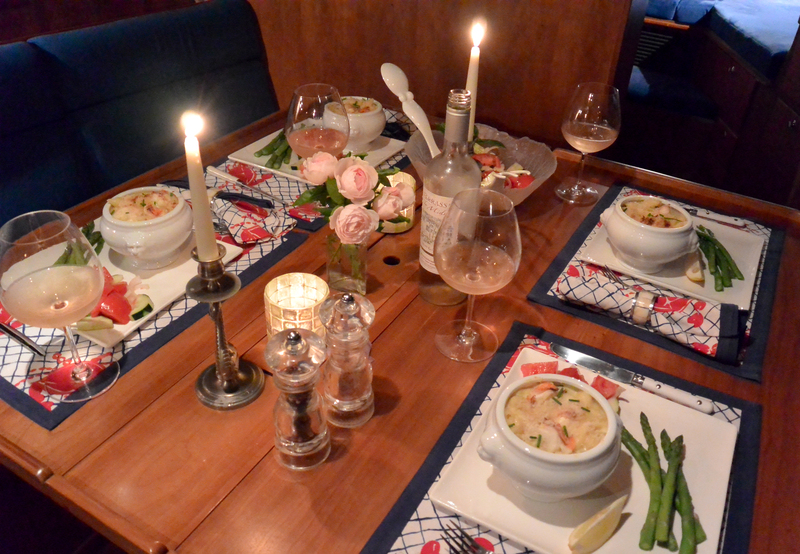 Now throw LOBSTER into the mix and suddenly it’s cool for grownups to eat Mac ’n Cheese. And we’ll pay a hefty price for it. There are a number of ways of getting your lobster meat, but we’ll go into that on another lobster post. 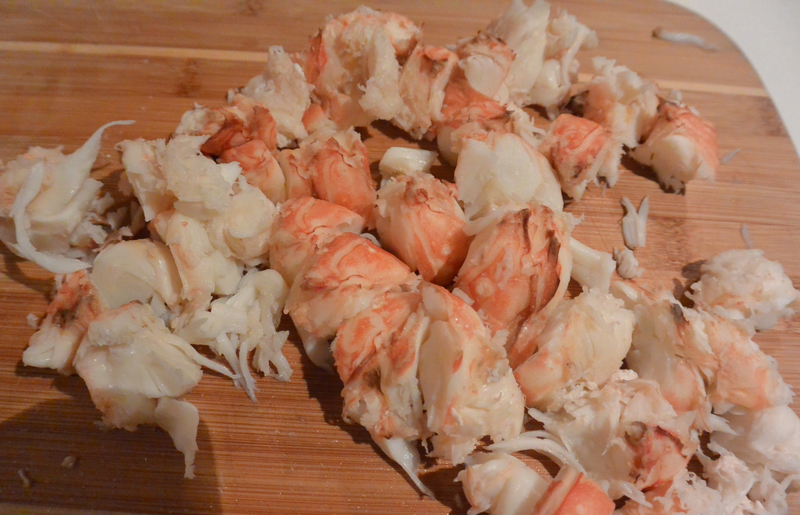 Today we’re starting with frozen, uncooked lobster tails. Meanwhile, in a separate pot, boil your pasta water. Be sure to add salt to the water. I planned on serving asparagus with the meal so I did something a little unconventional. 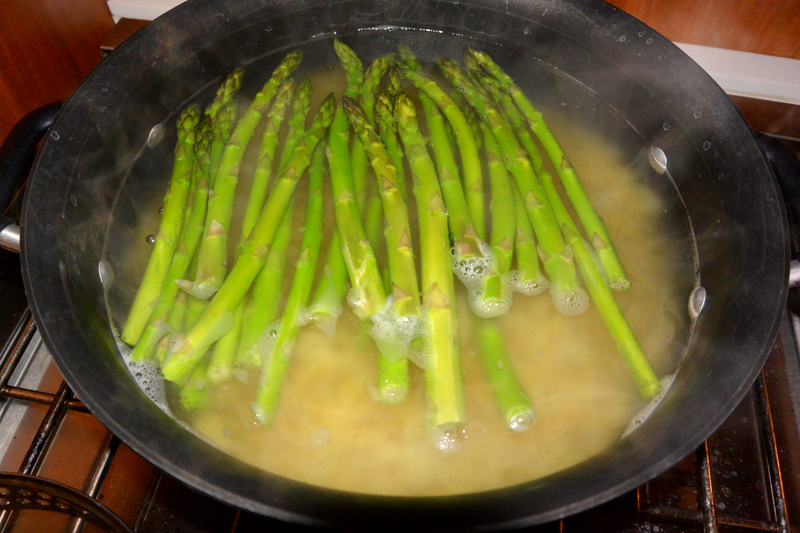 I threw the fresh asparagus on top of the pot of boiling pasta just long enough to find the tongs and pull them out. Maybe 3 minutes or so. It saved putting another pan on the little galley stove. 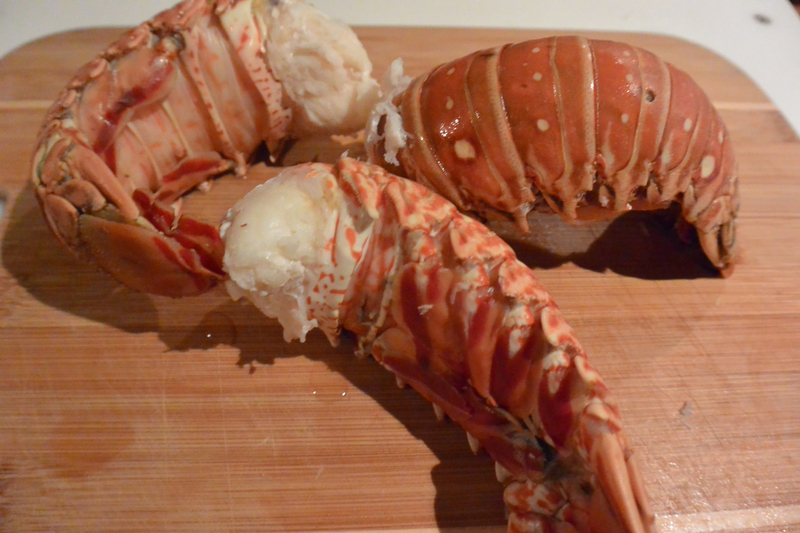 Now pick the meat out of the lobster tails. Use scissors to slice down the underside middle of the tail. Pull apart and pull out the meat. This took longer than I anticipated, so maybe some of you out there have tips for cleaning the meat out of a lobster tail. Chop the meat and set aside. Light your oven and set to 350 degrees. Next make your white sauce. Melt 6 tablespoons of butter in a 4-quart saucepan and add minced shallots and pressed garlic clove. Saute for 3 minutes. Add the 1/2 cup of flour. Continue stirring for one minute. Gradually add the milk, one cup at a time as it thickens. Add mustard, black pepper and truffle salt. 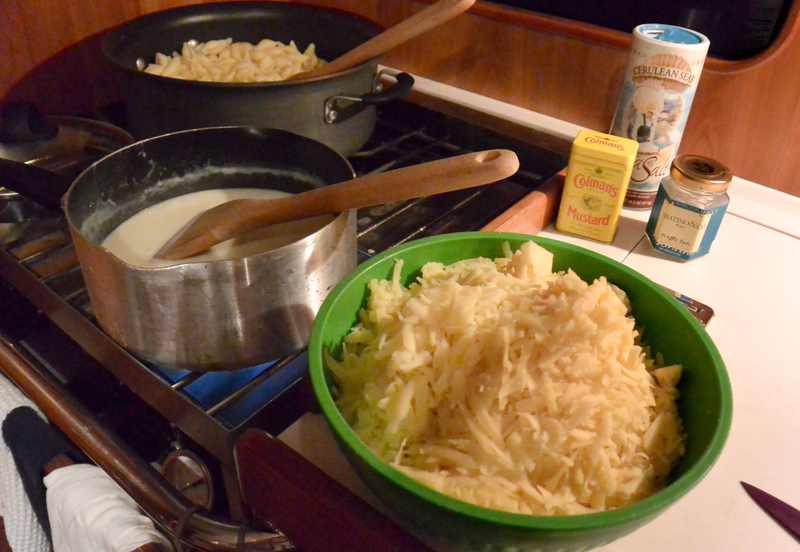 * Once thickened, add the shredded Gruyere and Cheddar cheese. * truffle salt can either be omitted or replaced with a few drops of truffle oil. Stir cheese mixture into the pasta. Fold in the lobster meat. Pour into one large casserole dish or 6 individual soup bowls or ramekins. 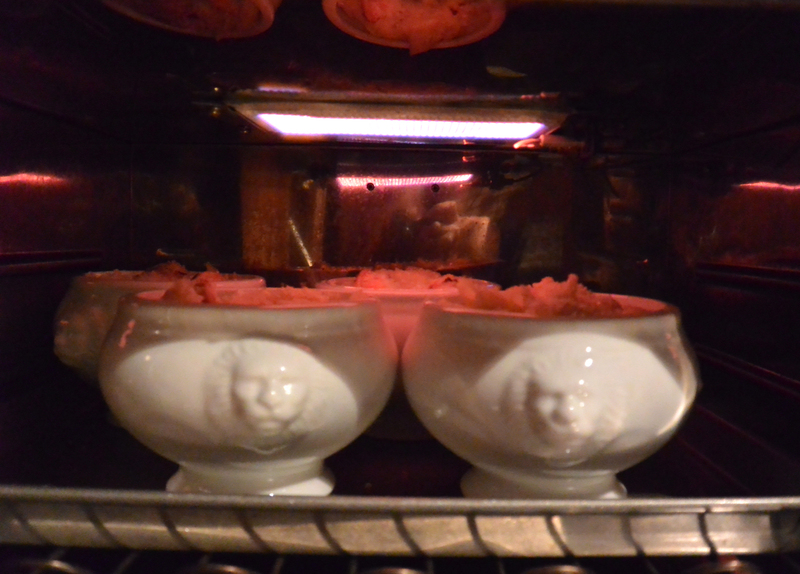 Top with bread crumbs and dots of butter, then place in your preheated 360 degree oven. Bake for 15 minutes if using individual dishes; 30 minutes for one large casserole. If you happen to have an oven that has a broiler (strange as it is in a Force 10) light it and let the tops crisp and brown for another 3 minutes or so. 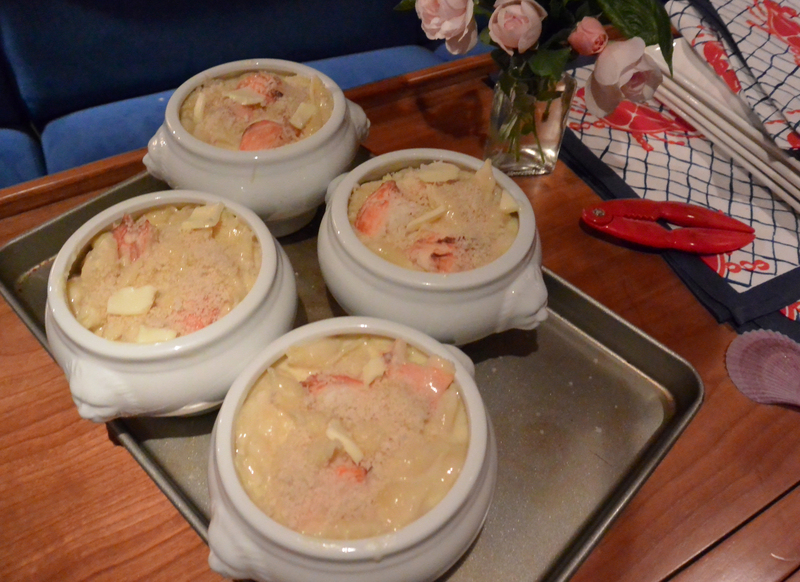 Lobster Mac ‘n Cheese…obviously…needs to be served with some light salad and vegetable. I also like to serve sweet fruit de mer, like lobster and crabs, with a dry Rosé, this one from Provence. No need to worry about getting a good night sleep tonight! 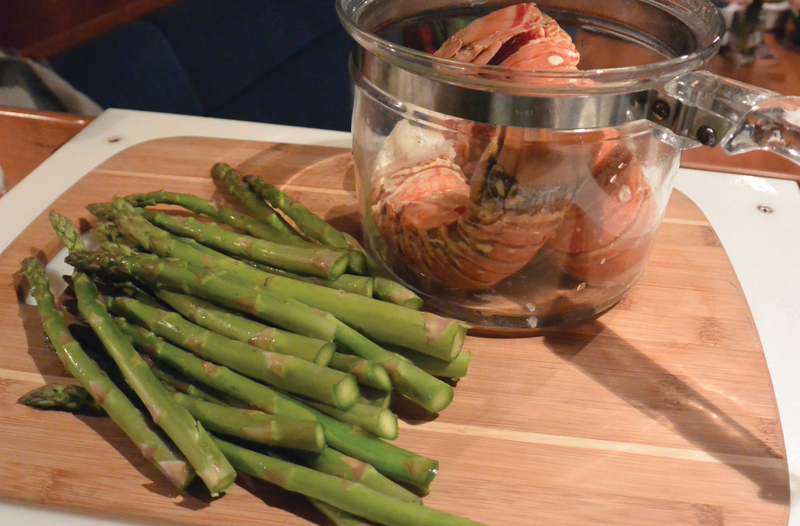 Adding lobster to this traditional "kid's dish" make it cool for adults to eat! 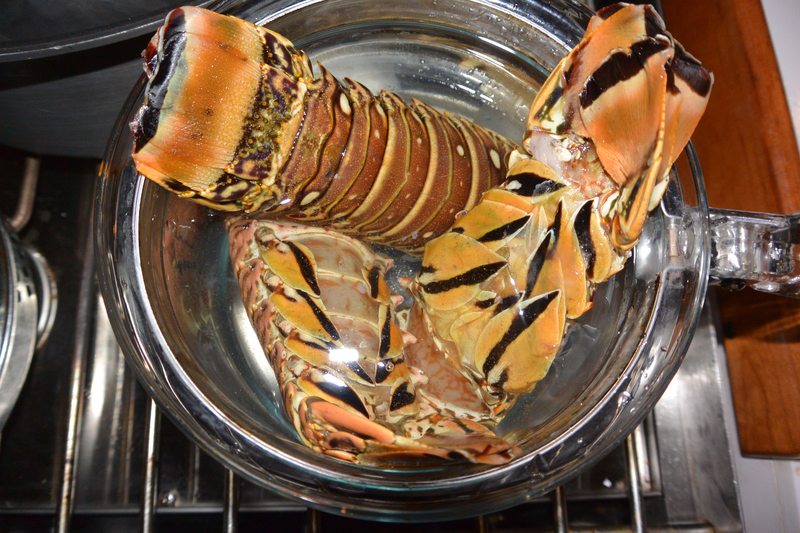 Boil the lobster tails for 10 minutes. Drain and set aside to cool. Once cool pick the meat out of the lobster tails. Use scissors to slice down the underside middle of the tail. Pull apart and pull out the meat. Chop the meat and set aside. Light your oven and set to 350 degrees. Meanwhile, in a separate pot, boil your pasta water adding a fair amount of salt to the water. Melt 6 tablespoons of butter in a 4-quart saucepan and add minced shallots and pressed garlic clove. Sauté for 3 minutes. Add the 1/2 cup of flour. Continue stirring for one minute. Gradually add the milk, one cup at a time as it thickens. Add mustard, black pepper and truffle salt. (if using) Once thickened, add the shredded Gruyere and Cheddar cheese. If you happen to have an oven that has a broiler light it and let the tops crisp and brown for another 3 minutes or so. You are my new heroes!! I am addicted to Mac and Cheese and LOOOVE lobster! Pure genius!!! This is so filling. My husband (Skipper Doug) doesn’t like Mac and Cheese OR lobster so we had lots left over. Wish I could have shared with everybody!! Thanks for checking in! !